The ROM for Sega Master System [BIOS] Hang-On (USA, Europe) (v3.4) gets its CRC calculated wrong. Romcenter lists the ROM requiring a Crc/SHA-1 of "8edf7ac6" as in the DAT. $ ls -go "[BIOS] Hang-On (USA, Europe) (v3.4).sms"
$ crc32 "[BIOS] Hang-On (USA, Europe) (v3.4).sms"
$ sha1sum "[BIOS] Hang-On (USA, Europe) (v3.4).sms"
Strangely enough, when loaded into Romcenter, that file appears with a Crc/SHA-1 of "161fbfcf" and a Real format of ".gg". Being one single ROM failing, I've been thinking it's a mistake on my side, but I'm unable to figure out what's happening and all points to something now working ok in the application. Hi The datafile specifies to romcenter to use the sms plugin. With this plugin, romcenter analyses the rom structure and skip any non relevent data to calculate the crc. Then it suggests an extension which matches the file structure. But in your case, this rom is not a 'real' rom, it is a bios. These roms will be handled correctly in the next verison. I get what you mean and understand it, but this issue went a bit further today: I did a Reload of the folder with the ROMs and one game that initially was accepted, Sonic Spinball (Europe, Brazil), now appears as unknown. The checksums are OK manually but Romcenter again calculates it wrong, and in this case it's a regular game (not a BIOS) and recognizes a .sms format. Just telling for adding more information to the issue, I'll check in the next release. Thanks. 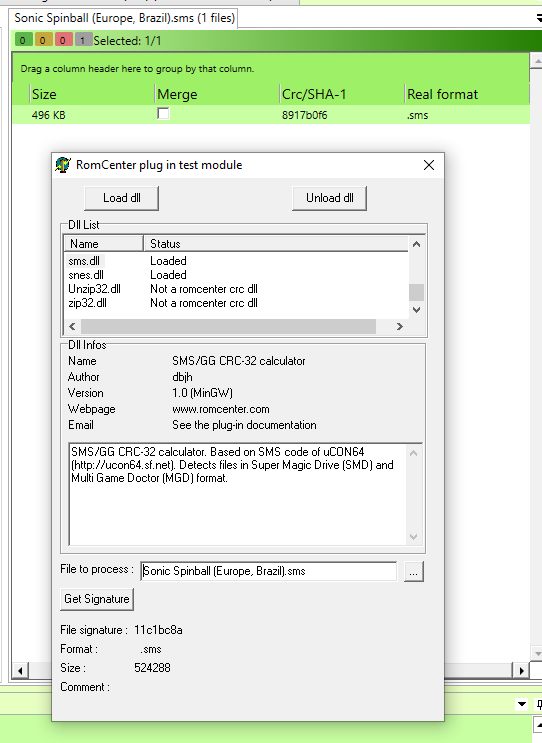 Iv've tried the RomCenter plug in ther module with the sms.dll plugin for that last ROM I commented and I'm getting a different checksum in the application than in the test module. Again, this project is fantastic, thanks, I'm just trying to add feedback for fixes.